According to the latest Mobile Life Report, published by The Carphone Warehouse, kids rate their mobiles as their best friend. 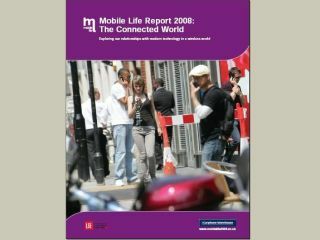 This is the fifth iteration of the report, which is the result of a study that has been running since 2006, studying the relationships 6,000 adults and kids in the UK and US have with mobile and internet technology. Dr Sorensen, senior lecturer in Information Systems at the London School of Economics and Political Science said: "We found interesting similarities and differences in our study of two countries. "Although we found differences in the use of email, SMS, instant messaging, and landline phones for staying in touch with friends and family between the two countries, we found no differences in the level of mobile phone use for these purposes." The report discovered a larger amount of teenagers in the US were using SMS messaging more than ever before, where traditionally they have lagged behind their more technologically-minded European and South-Asian cousins. "Since the dawn of the mobile age in the mid-'90s, Europe and South-East Asia have seen much more advanced use of mobile phones than USA. Mobile Life 2008, however, found that a significant proportion of North American youth is clearly engaged in intense use of SMS messages," said Sorenson. "The internet and mobile phones play an important role in breaking traditional barriers for engagement. There is an appetite especially amongst the youth across the two countries to engage, discuss, and communicate. "This is reflected in over a third of the children in both countries nominating the mobile phone as their most important possession, while the adult generations were most likely to nominate the TV," he added.